They are the orphans of savage wars, drifting back into the territories of yet-unconquered people, a reminder of the constant struggle against the forces of chaos. Shunned by humanity, the half-orcs have learned to survive on their own, through savage barbarism: What is not freely given must be taken by force. The half-orc does not seek pity nor compassion, but fear and respect. Each Heroes of High Favour book contains a toolkit of additional feats, skills, concepts, and prestige classes to explore your race's favoured class. 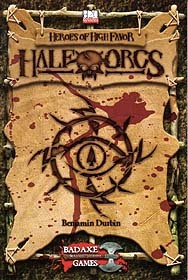 Half-Orcs features background information and role-playing tips for ten unique half-orc prestige classes, as well as new feats and new uses for old skills specific to barbarians. New Craftsmanship rules detail savage weapons and armour as well as quick-and-dirty "shoddy craftsmanship", so you can arm your horde in a hurry. New Handle Animal rules allow comprehensive (yet simple) cross-breeding of fantastic guardian beasts, and you'll find additional uses for your Intimidate and Wilderness Lore skills as well. Heroes of High Favour: Half-Orcs is the definitive sourcebook for half-orc characters of every kind.